One of the most amazing new CD to come along in years is the major label release from a young man singing in a classic soul style. 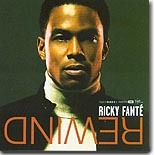 Ricky Fanté's Rewind is this month's Pick Hit. Etta James shows no signs of slowing down, as evidenced by her newest disc, Blues To The Bone, our Surprise pick for August. Country singer Charlie Rich stepped away from his normal format in 1992 for the bluesy / jazzy Pictures & Paintings. It's featured as this month's Flashback. This month's What's New section features new releases from Bobby Rush, Vassar Clements (playing the blues fiddle), James, Cotton, Watermelon Slim, Maria Muldaur, The Knight Brothers, Deborah Coleman, David Gogo, Paul Oscher, W.C. Clark, Willie Walker & the Butanes, Duke Robillard, Pinetop Perkins, and more.